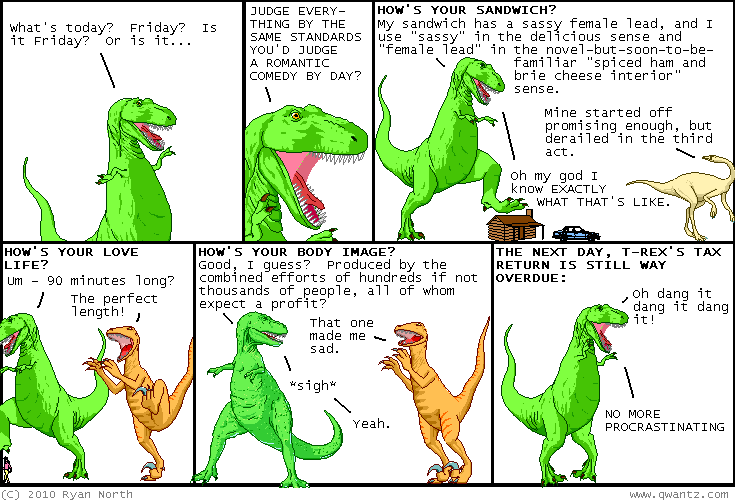 Dinosaur Comics - June 25th, 2010 - awesome fun times! June 25th, 2010: As proposed yesterday and as inspired by Samantha and Martin's story, today is "Feel Free To Say Hi If I'm Wearing A Dinosaur Comics Shirt Day, Woooooo!" Wear your Dinosaur Comics shirt today to invite other readers to talk to you! If you don't have one, keep an eye out for an interesting-looking person who does! And if anything awesome happens, please let me know; I am looking for LOVE.